Ulla Wobst has a solo exhibition with 20 works in Rome,Galleria 'Il Collezionista', Via Rasella 132, from October 1st to 12th. The opening is on October 1st, 19.00 o clock. Ulla Wobst thankfully received the CERTIFICATE OF HONOUR, attributed to her for her work AFTER ALL THESE JOURNEYS; ULYSSES by Robert and Dott. Gabriele Giuliani, Rome, Dec, 16, 2017. 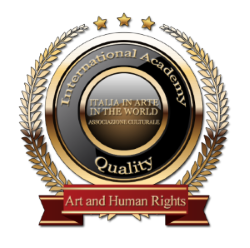 Ulla Wobsts participates in the MANTOVA International Biennal of contemporary Art ( Nov. 4th - 10 th , 2017 ) with her paintings : SONG OF A BROKEN DOLL and UNDER THE SURFACE . Ulla Wobst was presented the prize 'Segnalati' at Edinburgh, Nov. 14th/16th, 2015 . She is presented in the book 'Segnalati' ( by Salvatore Russo) with 3 works and exhibited her painting NOCTURNE at the event. She also received the UNICEFdocument for her paticipation in the event ARTISTS FOR UNICEF. Yesterday Ulla Wobst sold her painting MITWISSERIN / ACCESSORY to private collectors in Norway. in Edinburgh, 14th to 16th November, with her painting CLAIR DE LUNE. Ulla Wobst received the Leonardo Award, Third Prize, for her work THE MUSIC OF LIFE; Chianciano Biennale 2015.